Choose the word that is most similar in meaning to individuality. Choose the word that is most similar in meaning to input. Which of the following statements from the text best express the central idea (central claim) of Paige's argument? "We should focus on school, not our outfits." "Principal Schuman said that student input would be an important consideration in the decision about uniforms." "I know many students are worried that uniforms would restrict our freedom of expression." "No one would be able to wear gang colors or symbols." Which two statements best support the central idea (central claim) of Paige's argument? "And you know what? I think it would be amazing!" 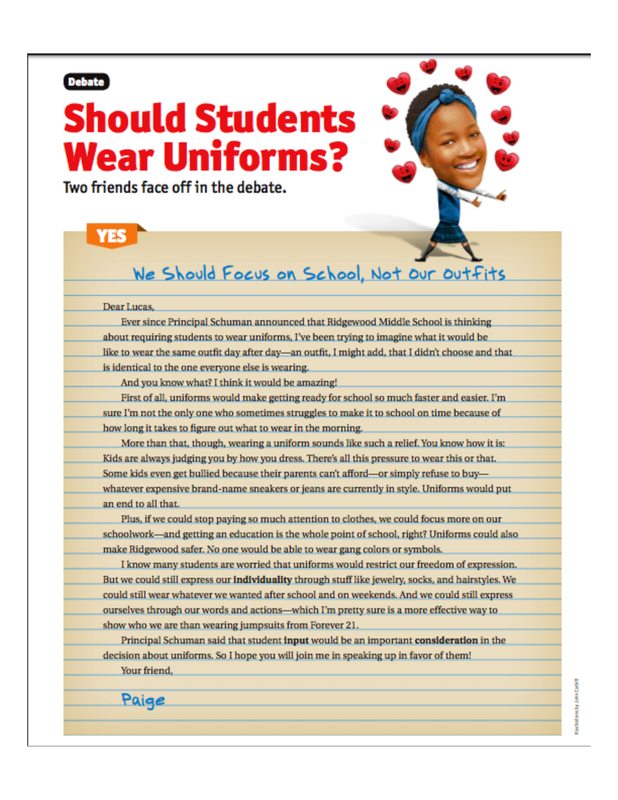 "Ever since Principal Schuman announced that Ridgewood Middle School is thinking about requiring students to wear uniforms, I've been trying to imagine what it would be like to wear the same outfit day after day--an outfit, I might add, that I didn't choose and that is identical to the one everyone else is wearing." "Some kids even get bullied because their parents can't afford--or simply refuse to buy--whatever expensive brand-name sneakers or jeans are currently in style." "Uniforms could also make Ridgewood safer. No one would be able to wear gang colors or symbols." Choose the word that is most similar in meaning to aspect. Choose the word that is most similar in meaning to punctuality. 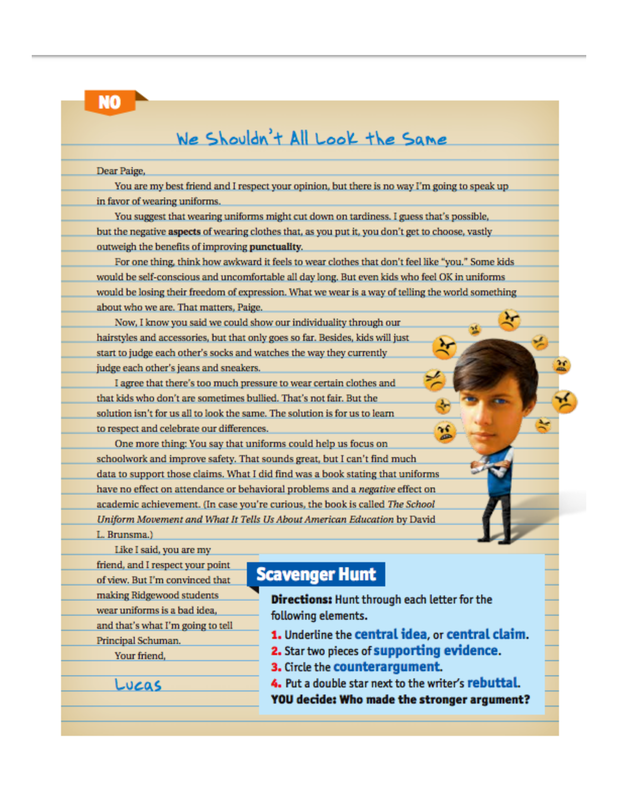 Which of the following statements from the text best express the central idea (central claim) of Lucas's argument? "You are my best friend and I respect your opinion, but there is no way I'm going to speak up in favor of wearing uniforms." "You suggest that wearing uniforms might cut down on tardiness." "The solution is for us to learn to respect and celebrate our differences." "But I'm convinced that making Ridgewood students wear uniforms is a bad idea, and that's what I'm going to tell Principal Schuman." Which two statements best support the central idea (central claim) of Lucas's argument? "For one thing, think how awkward it feels to wear clothes that don't feel like 'you'. Some kids would be self-conscious and uncomfortable all day long." "I agree that there's too much pressure to wear certain clothes and that kids who don't are sometimes bullied. That's not fair." "You say that uniforms could help us focus on schoolwork and improve safety." "What I did find was a book stating that uniforms have no effect on attendance or behavioral problems and a negative effect on academic achievement."